Birdland gives you your own birdcage to play with and the goal is to keep your bird happy and well fed. You can house several birds in your cage with the ability to expand the cage to hold more birds as you level up in the game. You can do several things in the game such as feed and give your birds water. 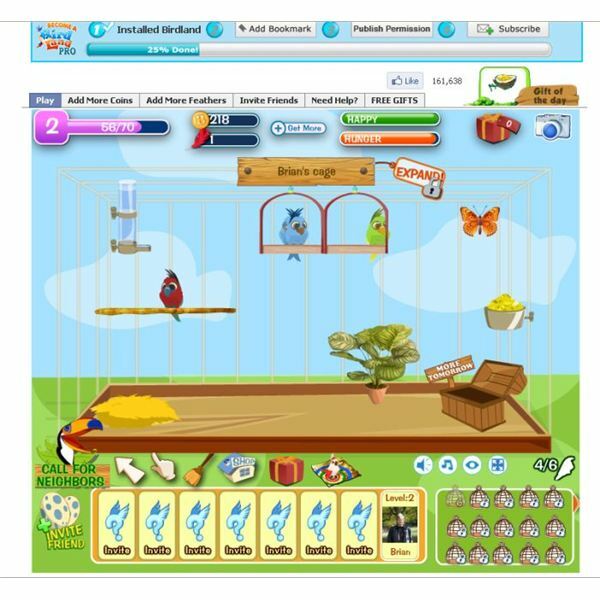 You can use the hand tool and play with your birds which will increase their happiness. There is a chest where you can collect additional coins once per day and even a small mini game you can play for add ional coins too. Many different birds are available such as canaries, love birds, parrots, starlings, flamingos and others. As you play you can unlock new birds depending upon your level in the game. 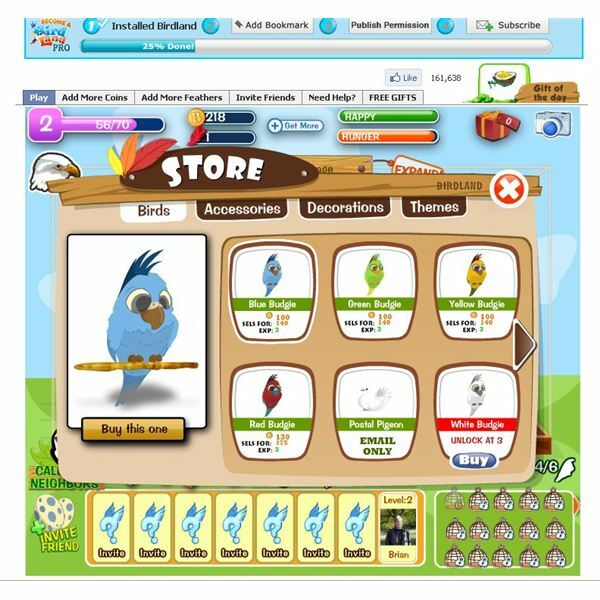 Use the game store to buy various decorations for your birds and change the background theme too. It is easy to add new birds to your game and you start with the ability to hold up to six birds in your cage. Your birds will start out young and eventually reach adulthood and be able to breed. Once your birds are fully grown you can sell them too for coins or just keep them in your cage. As you level you will unlock more cages and the ability to house additional birds. When you buy a bird you can accept the default name or give your bird a name. You can provide food and water for your birds with the various feeder you will find in the store. Once your birds hunger meter drops they will want to be fed so be sure to keep your feeders full. You will also need to periodically clean the birdcage with the sweeper tool. If you have Facebook friends playing the game you can visit their cages and clean them which will yield you more coins. In addition to your birds you have options to decorate your cage. You can add additional perches for your birds to sit on, different colored feeders, bird houses, and even bird toys at the higher levels. Other decorations include plants, trees, butterflies, shells, and statues. There’s a nice mix of various decorative options at different levels in the game so you will always have something new to add to your game. You can also find different themes which will change the cage background for you. It is easy to move objects around your cage using the selection tool and it will also show your birds statistic bars. Using the tool will allow you to refill the water and food trays too which will yield you some experience points. Birdland is a fun game to play if you enjoy birds to any degree. The game is essentially the same as the aquarium games you will find on Facebook just substituting birds for fish. The game has a lot of different birds to add to your cages and variety in the items you can buy in the game store. It has a nice catchy soundtrack and looks nice graphically. On the negative side the mini game you can play for more coins is not the greatest and could use some work.